Two of Maryland's top elected officials urged seniors to guard their personal information and encouraged adult children to keep track of their parents' financial dealings as part of an effort to bring attention to elder financial abuse and fraud. WASHINGTON — Millions of people are ripped off by identity thieves scam artists and straight out crooks. Many of them are trusting seniors like your parents. And for Maryland Comptroller Peter Franchot, it’s personal. “I’m very sensitive on this issue of abuse of seniors,” Franchot said Monday during a kick-off event for PROTECT week. He discovered that solicitations she received in the mail were made to look like bills. Thinking that she owed money, she would send a check. The effort is intended to bring attention to elder financial abuse and tax fraud prevention and help educate the public so they can protect themselves and their aging family members. 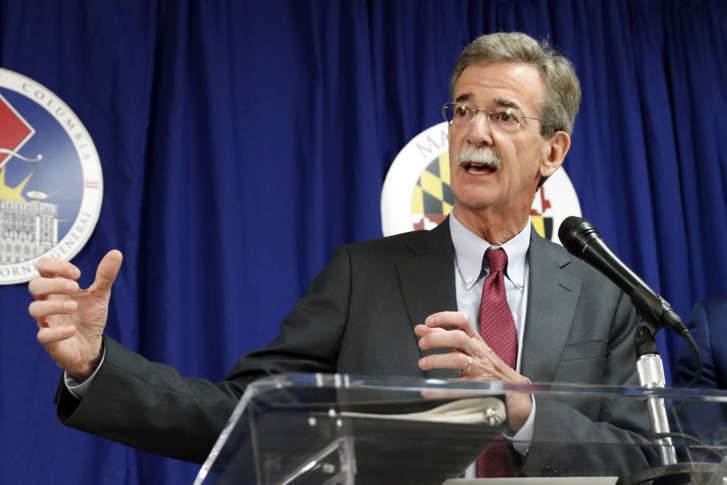 Maryland Attorney General Brian Frosh said he saw the same kind of things coming to his mother. “She got a million unsolicited offers and many were fraudulent,” he said. Both Maryland officials said that seniors need to guard their personal information. And adult children need to be more attentive to their parent’s financial dealings and watch out for those who would take advantage of them. Frosh also warned about phone and e-mail scams. But it’s not just mail scams adult children should be watching for, tax refund requests represent another risk for identity theft. “180 million in fraudulent tax refund requests. 80,000 (fake tax returns) filed on behalf of people whose identities have been stolen – often they are older people who have given the information over the phone,” Franchot said. Frosh warned that no one is immune to the threat. “My first year as attorney general, somebody filed a tax return in my name and my wife’s name. If it can happen to me, it can happen to you,” Frosh said. It happens to people all over the U.S. every single day of the year. In the past 12 years, there have been more than a billion breaches of personal information. That is more than three times the number than there are people in the United States. According to the nonprofit credit counseling agency, Guidewell Financial Solutions, the average victim of elder financial abuse loses upwards of $120,000. – Create strong passwords for all of your accounts. It shouldn’t be your birthday or daughter’s name, choose something that isn’t intuitive. It ought to have letters, numbers, exclamation points or other punctuation to make it harder to crack. – Don’t give out personal information over the phone. If you don’t know whom you are talking to, don’t tell them anything about yourself. If they ask to speak to your spouse and you say, for example, he’s not here or he’s passed away or she’s in another state, that’s information they can use to your detriment. – Use a shredder. Don’t throw financial information into the trash, shred it instead. Dumpster divers go out looking for personal information, bank accounts statements, etc., and use it to impersonate victims. – Review credit reports periodically. You can do it twice a year for free. – Look at your financial accounts on a regular basis to ensure there are no unauthorized transactions. Anyone who suspects that an older adult is being mistreated or is the victim of financial exploitation or fraud is urged to call the Maryland Department of Aging at 1-800-332-6347 or the police. The Comptroller’s Office will take part in a presentation on elder financial abuse fraud featuring EverSafe, the Maryland Consumer Rights Coalition and the Montgomery County Office of Consumer Protection. Speakers also will address policy issues for the first day of the 2018 Maryland legislative session. Comptroller Franchot will join representatives from the Montgomery County Office of Consumer Protection, the Montgomery County State’s Attorney’s Crimes Against Seniors Division and the Maryland CASH Campaign to provide tips and highlight resources available to seniors to help protect their identities and prevent financial abuse and loss. Deputy Comptroller Sharonne Bonardi will take part in a presentation for Maryland’s veteran community on tax assistance and resources to help safeguard financial well being. Also participating are AARP, the Maryland CASH Campaign and Robert E. Frey from the Attorney General’s Consumer Protection Division.